Since the 1980’s, sneaker collecting has been a thriving hobby for those who enjoy being trendy and fashionable, and while wearing the hottest brands of footwear may improve your image, many “sneaker-heads” have found that SELLING those popular brands can also improve their BANK ACCOUNTS. With the power of the internet and long established sites such as eBay, sneaker buying and selling has been around for quite some time now — but with many good ideas such as internet marketplaces, comes those who will fine tune the process and create new and improved successors to the online world. Fast forward to 2015 where a new start up company came into existence by the name of StockX. StockX is a “stock market” for — you guessed it — sneakers. And while it’s idea of buying and selling shoes is nothing new, StockX essentially combined two familiar ideas into one: the stock market and online auctions. By doing this, they’ve created a whole new way to invest in the popular footwear that many people today are interested in. StockX uses a very similar format to a traditional stock market’s limit order. “Asking Prices” and “Highest Bids” are shown throughout StockX’s site so when it comes to setting preferences, the buyer and the seller can set their prices accordingly. StockX then uses these amounts to organize sales so that both parties walk away with their terms met. When a seller’s price coincides with the bid being offered by a buyer, StockX will notify the seller that a buyer is willing to pay their price and the seller will then ship the pair of shoes to StockX for inspection to make sure the shoes are legitimate and in good condition. If the shoes are indeed authentic and in good shape, StockX then will tag the shoes and send them out to their new owner. 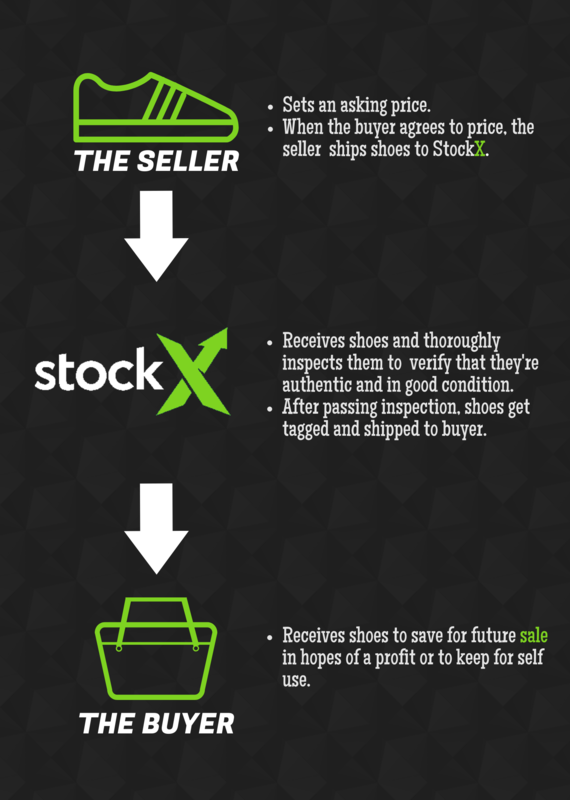 One example I made for how purchasing shoes on StockX works. While the idea of StockX may excite you enough to want to take part in their marketplace, it is important to PREPARE yourself accordingly if you hope to get the best bang for your buck. Whether you decide to be a buyer or a seller, it is crucial to first do your research about the different shoes you are going to be dealing with before purchasing or selling. Much like a traditional stock market, prices will fluctuate constantly and if you don’t follow the price trends, you could end up losing money. If you are looking to sell on StockX, it is important to pay attention to the previous bids that have been offered for your specific pair of shoes. Taking the size into account, check to see what prior pairs have sold for. By looking at a shoe’s historical graph, you can see how the shoe’s value is fairing now as opposed where they were months ago. If a shoe looks to be rising in value over time, it is a good sign that you may be able to get away with setting your “Asking Price” a bit higher than it’s current price value. On the contrary, If a shoe’s value is trending downwards in value, an elevated asking price may not be as beneficial for you. If you ask for too much or wait too long, you may not be able to sell your pair of shoes as soon as you were anticipating or you will end up selling them for much cheaper than you were originally hoping to sell them for. With any investment you make, it is up to YOU to decide whether you are willing to hold onto it or not. In some cases, certain shoes become collectors items and will rise in price again over time, but remember that there is always the risk that it’s time in the spotlight will eventually fade and that style may become out of date later on. Much like the selling aspect of StockX, buying is just as much a numbers game. Especially if you’re looking to invest in a pair of shoes to sell again in the future, you want to snag the best bargain right? Using all the same tools as I mentioned above in the sellers portion, If you pay attention to the history of a shoe’s value, you’ll be able to get an idea of where that shoe’s price may be headed in the future. When looking at the data of a specific shoe, you have to take into account what you plan on doing with that shoe… is this a shoe you plan on keeping?… or is it an investment you are looking sell again later on? If you are buying for your own use; then the cheaper – the better. If a shoes value is going downhill, then it’s best to test how low it can go. If you are looking to INVEST in a shoe on the other hand, you most likely don’t want to invest in something that you logically see dropping over time. While it is true to “buy low and sell high”, the shoe market may not always behave the same as a traditional stock market. Trends die out; shoes that were popular 10 years ago may be obsolete now, and while there is always the exception of a collector’s item like I mentioned before, many times certain trends don’t hold enough influence to survive over time. This is why buying a shoe to invest in gets a little tricky. While I completely agree with the buy low – sell high mentality, the question remains: what do you look for when it comes to those highs and lows? In all honesty, no one can predict the future in it’s entirety; all we can do is make an educated hypothesis with the information that we are given. If a shoe is fluctuating enough to the point that you can see a consistent pattern in it’s history, then you can better predict when a low price might be worth the investment. If a shoe keeps jumping up, then down, then up, and then down; then you can have more of a reassurance that your investment will be a good one, especially if the new highs continuously beat out its previous ones. If you are able to see patterns and act accordingly to those patterns, then you’ll be able to not only apply this ability to StockX, but also migrate into other investments down the road as well. While shoe collecting may not be for everyone, it is definitely growing in popularity as time goes on. With sites like StockX, you have the ability to take what could be a hobby of yours and make money from it. With the proper research and execution, anyone has the ability to benefit from these types of sites. I hope that this article gave you a new idea when it comes to investments you can be a part of. If you liked what you read, feel free to bookmark my site and share it on social media. Make sure to also keep an eye out for future articles similar to this one if you are an aspiring to make a better financial future for yourself. Thank you, and I’ll see again soon.